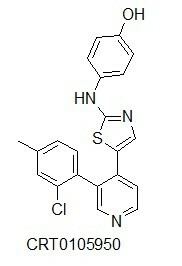 Relevance The LIMK inhibitor CRT0105950 is a novel, selective, potent LIMK inhibitor, which inhibits p-cofilin and inhibits invasion in a Matrigel inverse invasion assay. LIMK1 has been reported to play a key role in tumour cell invasion, and the level of LIMK1 is increased in breast and prostate cancer cell lines in comparison with less invasive cell lines. The LIM kinases (LIMK1 and LIMK2) phosphorylate and inactivate cofilin which allows them to act as regulators of actin cytoskeletal dynamics and microtubule organisation. In vitro applications The compounds exhibit low uM potency in breast cancer cells showing dose dependent inhibition of phosphorylation of the LIMK substrate cofilin. Treatment of MDA-MB-231 breast cancer cells with the compounds significantly reduces their ability to invade a matrigel plug in an inverse in vitro invasion assay. Furthermore, the inhibitors effectively reduce fibroblast-led collective invasion in a co-culture organotypic model. Charles et al. 2015. J Med Chem. :. PMID: 26356364.